Gretsch delivers the goods once again. A good looking and great sounding kit at a competitive price-point. A few more shell-pack options wouldn't go amiss. Gretsch's Taiwanese-manufactured Catalina Maple series sits quietly between the brand's mahogany-shelled Catalina Club and Rock kits and the more pro-spec Renown Maple series. Bridging the gap between the two, it offers another option at a midway price-point. "The snare drum is impressively versatile: played gently it is perfectly civilised and responsive; showing it a 2B in anger reveals its more muscular attributes. " First introduced in 2005, the Catalina Maple series was revamped at the end of 2011 and is currently available in a single configuration - 22"x18", 14"x6", 10"x8", 12"x9", 14"x14" and 16"x16". 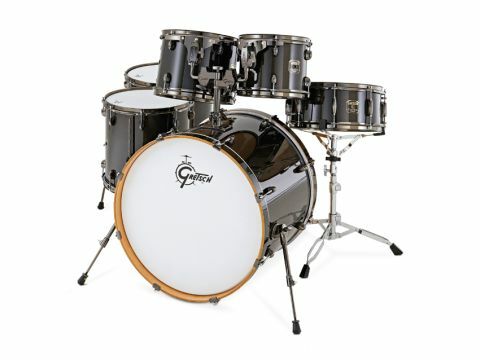 Individual drums are obtainable but the generous six-piece shell-pack makes the need for extra drums unlikely. Like the Renown Maple Series above it, Catalina Maple drums are 100 per cent maple, though made from Asian rather than North American wood. Shells are 7-ply, and 7.2mm thick across all drums. The first Catalina Maple drums had 45° bearing edges, but since the makeover Gretsch's trademark 30° bearing edge has become standard across all CM drums. The edges are rounded rather than sharp, ensuring plenty of head contact. Checking the shells for trueness finds them well within tolerance levels, with even the larger drums being only around a millimetre outside of true roundness. Finish options are limited to four gloss lacquers, with no wrap alternatives. The Transparent Ebony Gloss of the review kit is a black stain which keeps the grain of the wood visible - deliciously so - beneath its coats. Tied in exclusively with the Ebony finish is black nickel hardware, which covers every metal component, with the conspicuous exception of the tension rods. This oversight apart, the nickel plating looks great as it adds a further dimension of almost liquid blackness to the drums. Choosing the Ebony finish does mean paying extra for the nickel plating, making the other three finish options with their standard chrome hardware even better value. With a large chunk of the asking price clearly being invested in the shells - all that maple and lacquering requiring outlay and effort - costs are recouped across the kit in subtle ways. Familiar Gretsch accoutrements found on Renown Maple and beyond such as Silver Sealer and die-cast hoops have been omitted here in favour of simple sanded shell interiors and 1.6mm triple-flanged hoops. The bass drum spurs could be filed under 'reasonably hefty' rather than 'totally over-engineered' while the mini-GTS suspension mounts on the rack toms only hook up to two lugs rather than the usual four. They're still suspension mounts though and the toms have, as we discovered, no problems ringing on. Gretsch has equipped the kit with a set of tasty Evans heads - coated on the snare and toms and sporting dampening rings on the bass drum. A good head can only improve the sound of any drum and this is immediately noticeable with the bass drum. Without dampening or a port-hole, there is no trace of boom and boing; just a drum at the open end of the sound spectrum breathing naturally while still being capable of punching through. Hit softly it is warm, dark and airy. Upping the velocity finds it sounding more generous of note - bigger and obviously louder. But the shape of its response alters as well, with the arrival of a slap of solid attack that drives home in the manner of a boxer's jab. Adding in dampening finds the sound morphing again into something more compressed and altogether hard-edged. The snare drum is also impressively versatile. Played gently it is perfectly civilised and responsive; showing it a 2B in anger reveals its more muscular attributes. The drum's depth adds considerable authority and instils it with unmistakable throatiness - even at timbale-like tunings it still cuts through ferociously. At calmer tensions its note broadens to a thick 'blat' that combines a woody note with just the right proportion of edge ring. The toms sound exactly as you'd hope Gretsch toms would - deep, musical and gloriously resonant. Again the Evans heads show their worth, encouraging the toms to sing with almost uninhibited fullness. Multi-tom fills bring an abundance of sympathetic overtones as the four diameters - from the bright and snappy 10" to the cavernous-sounding 16" floor tom - overlap each other in their respective decays.